The Harbour View Footbal Club (HVFC) will be sending 6 more U17 players to the an Academy Showcase, this time in Portugal. The 6 players include: 2 Jamaica College players, Jabari Howell (also HVFC player), and school teammate Shadane Lopez, Kingston College / HVFC forward Tyrese Williams, former HVFC Midfielder Horace Ramsay and Charles Tate from the new Jamaican-based MRC Football Academy organized by Onaje Bell, and HVFC/ Reggae Boyz U20 Midfielder Tyreek Magee. Letters of approval by parents and schools were granted to travel with General manager, Clyde Jureidini, as part of a HVFC group of players to participate in a 5-way Academy Tournament in Braga, Portugal against Länk Academy from Sweden between November 15-25th, 2018. 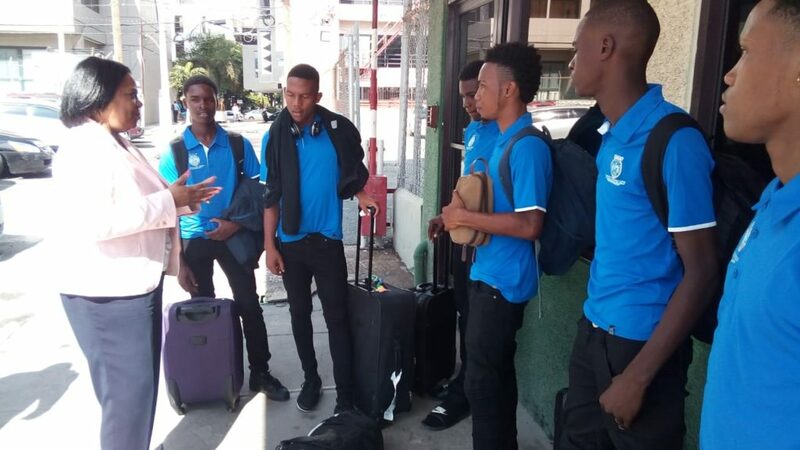 Mrs Pat Garel, PLCA General Manager, gave the youths a pep talk to congratulate and encourage the boys ahead of their journey from the Jamaica Football Federation office to the Montego Bay Airport. They will meet Jamaica College Midfielder Oquassa Chong, Seaforth High Midfielder Garth Stewart, St. Andrew Technical High School Defender Noel Walker Jr., and Spanish Town High attacker, Rennardo Robinson who are also a part of HVFC youth teams, and travelled to join the newly developed Länk Academy in Stockholm, Sweden in late September until November 28, 2018 through HVFC. They will be exposed to an international football lifestyle aimed at maximizing their personnel development as football professionals in Europe. Other players from Canada and Trinidad and Tobago have been in the programme since early August 2018, and Swedish clubs are to be possibly invited later. When the 20-30 players are selected after the Portugal Showcase, they will return to Europe in early 2019 to play in the Division 2 Academy League for six (6) months against many top European-based Academies’ Under 19 teams. This will expose them to high quality opposition, scouts, agents and clubs for potential career moves upward, stays at the Swedish Academy until age 19, go elsewhere in the football world, or return home. We wish them all the very best!